Hi guys, I am writing this post to share a theory/spoiler about the episode 310 “Firefly.” Have any of you watched the Tales From The Fringe videos that the Sprint site releases every week? If you haven't, you must see it to understand this spoiler. Click here to watch the videos. After you have seen all the videos, ask yourself how it is that the Peter and Walter scene from the previous episode connects to the story of Bobby. In the comic, the young man's name is Bobby Joyce, and his father is a musician (a.k.a. the character play by Christopher Lloyd). In Bobby’s dream, his father is very old and lives in a nursing home. Later, we see a boy (we never saw his face) catch a firefly that was supposed to fly 3 miles further so Madison (the little girl that gives Bobby the penny so he can call his dad) can catch it. Because the boy interfered, Madison didn’t catch the firefly and got lost in the forest trying to catch another one. Her father searches for her and, as a result, is late for work. As he hurries to his job, we hear the song “Hovercraft Mother” by Violet Sedan Chair. Madison’s father runs a red light and kills Bobby. Then we see the same scene from 309, “Marionette.” Why?. 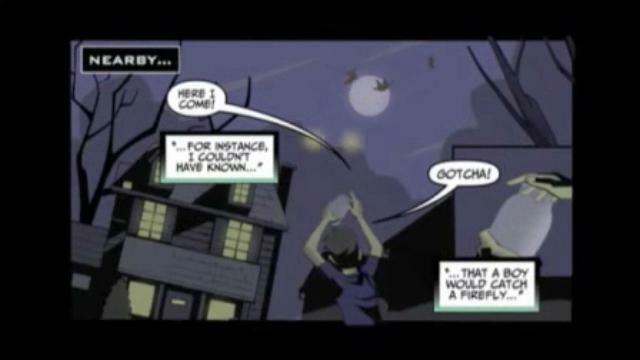 I think the boy who catches the firefly is actually Peter. He wasn't supposed to catch the firefly, because he is dead in this reality, but the fact that he’s here changes the future for Bobby, and probably for his dad, too. You can read this article in Spanish here. What a wicked theory, that would be awesome! I'm very excited for Fringe to start back up. I think that might be spot on! I wasn't sure how this all connected, but that theory makes logical sense. Will be interesting to see if it ends up being true next month.